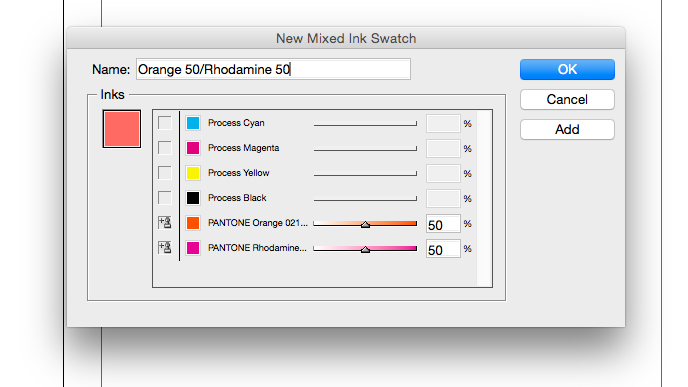 Learn how to create ink swatches and groups with these InDesign tips. Mixed inks enable you to create the maximum number of colours with a limited number of inks, and without increasing the separations used for printing. To create a mixed ink swatch you need to have one or more spot colours added to your colour palette. You can create the mixed ink by combining the spot colours together or by mixing a spot colour with a process ink (cyan, magenta, yellow and black). 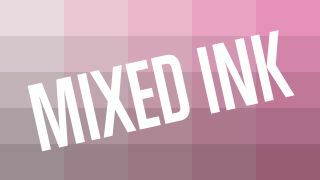 You can either create a single mixed ink swatch in your colour palette, or a mixed ink group that can be used to create multiple swatches in one go. 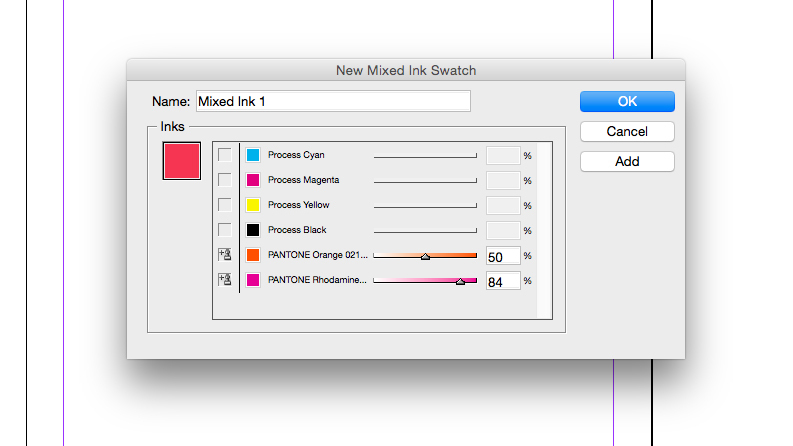 To create a mixed ink, go to the Panel menu in your Swatches palette and select New Mixed Ink Swatch. Remember, a mixed ink has to contain one or more spot colours, so if you haven’t added any spot colours, this option won’t be available to you. 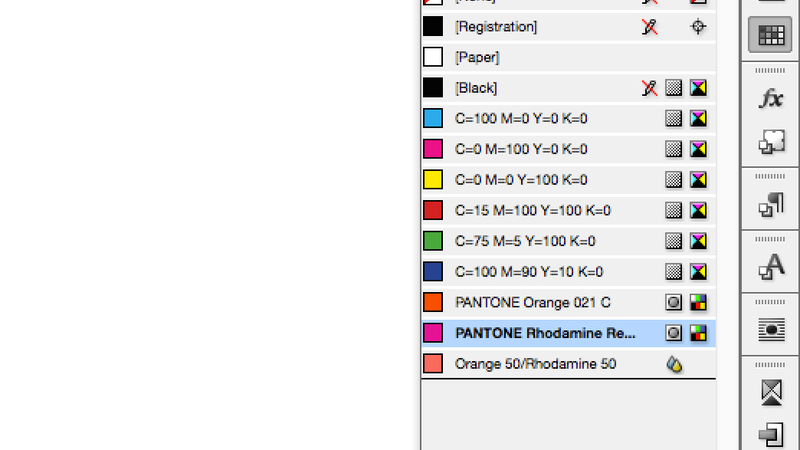 I’ve already added two Pantones to my Swatches palette, which I’m going to use for my mixed ink. 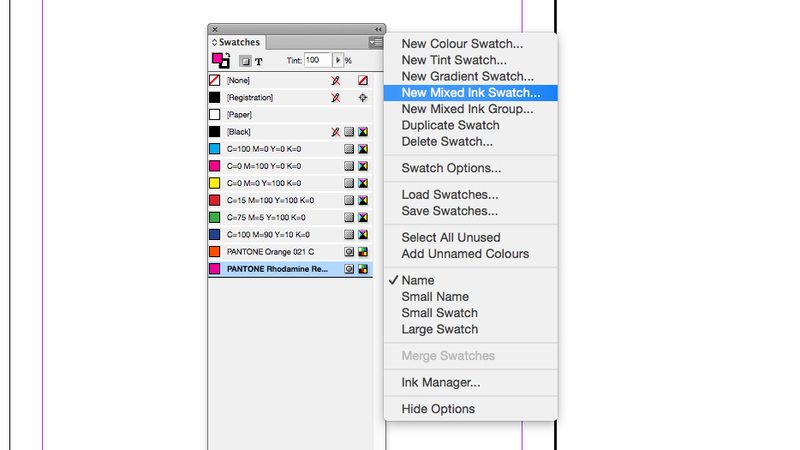 In the New Mixed Ink Swatch menu select the two Pantones by clicking the empty box next to your desired Pantone's name (an ink icon will appear). Add the percentage of each ink used by typing a value in the percentage box. Alternatively, you can use the sliders to adjust this value. You have the option to name the swatch if you wish to. To add the mixed ink to the Swatches panel, click OK to leave the panel. If you wish to add more swatches at this stage, click Add and the panel will remain open for you to add additional mixed ink swatches. The new mixed ink will now be visible in your Swatches palette, recognisable by the two-droplet icon that sits to the right of the swatch name.